Costa Rica is a dreamy escape for any couple, home to pristine shores lined with blossoming flora, lush exotic rainforests overflowing in tropical wildlife, breath-taking emerald waterfalls, and magnificent steaming volcanoes which rise high into the clouds. 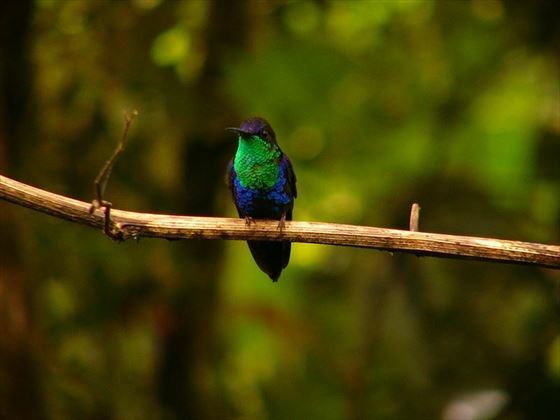 This spectacular 10-day tour is the ultimate way to explore all Costa Rica has to offer. Starting and ending in San Jose, the nation’s vibrant capital, you’ll head deeper and deeper into the serene wilderness, home to an endless amount of romantic experiences and adrenaline-fuelled adventure in equal measure. We want to ensure that your time here is as peaceful, romantic and fun as possible, and our selection of hand-picked accommodation is sure exceed your dreams; prepare for sunset cocktails on a private terrace, unwinding together to the melodies of the sea on a secluded beach cove, feeling the warm exotic waters encapsulate your skin as you swim with tropical marine life, stumbling upon enchanting waterfalls on a scenic hike, and sharing the once-in-a-lifetime experience of exploring a magnificent, active volcano – to name just a few of the adventures this tour offers (HOR). Upon arrival at San Jose Airport, you’ll meet with a representative and will be transferred to your hotel by a guide, who may advise you on the top tips, activities and places to eat in the city. After check-in, the rest of the day is to enjoy at leisure; we recommend seeing the beautiful parks, museums, art galleries and colourful colonial architecture, before the fantastic nightlife and cuisine here. Your accommodation for the next two nights is very elegant and luxury, with beautifully-appointed Victorian style rooms, a divine courtyard restaurant and lots of blissful amenities, such as a Jacuzzi and lawn beds situated on the rooftop garden terrace. Today involves a wonderful tour which immerses you in the gorgeous rainforest and coffee here. Starting with a coffee tour, you will ascend the mountain, noticing a difference in temperature and vegetation along the way to the Doka Coffee Estate – coffee plantations, fern, flower and strawberry farms will start to arise, overflowing with an array of colours and textures. On arrival to the coffee estate, enjoy a delicious breakfast before enjoying a tour of the coffee plantation, where you will learn about the ancient techniques used to produce some of the finest Costa Rican coffee, and the careful process involved in the cultivation, harvesting and roasting of the golden bean will be shown – a very hands-on experience. Then you’ll finally be able to taste the divine coffee. 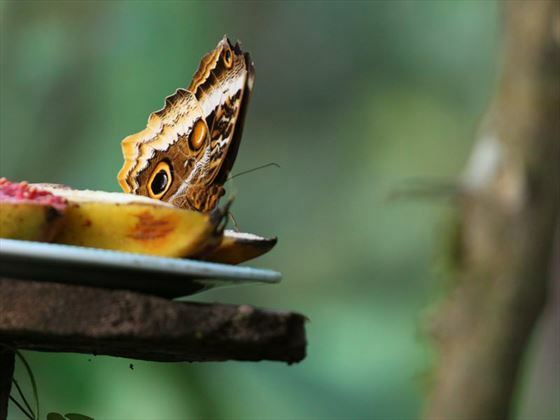 Afterwards, you will continue to La Paz Waterfall Gardens for a scrumptious lunch and tour. As you arrive, you’ll walk through a beautiful trail which leads to a stunning rainforest waterfall. 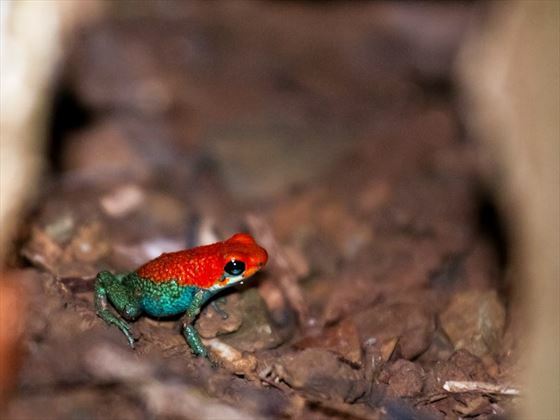 Inside the park, you will also observe butterflies, hummingbirds, frogs, orchids, snakes and big cats. 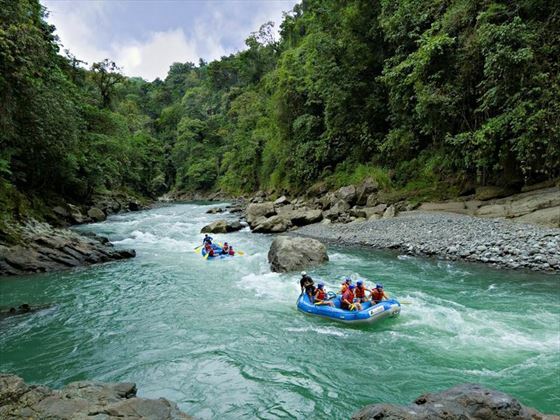 Today will involve an adrenaline-fueled river rafting adventure on the Pacuare River; Located on Costa Rica’s Caribbean slope, rated one of the top rivers in the world, it borderrs the Talamanca Mountain Range. You’ll experience the intimate rainforest ambience as you raft through on 19 miles of class III-IV white water - The warm tropical waters, cascading waterfalls, emerald rainforest and incredible wildlife sightings will indulge your senses on every level. The mountain range is home to native Cabecar Indians, parrots, toucans, deer, jaguars, ocelots, monkeys, butterflies and more. 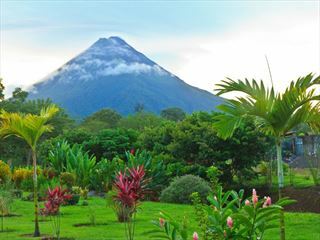 Afterwards, your guide will transfer you to your hotel in La Fortuna, where you’ll spend three nights. This region soars 350 feet above sea level, and acts as a fantastic base to explore the fascinating Arenal Volcano and National Park. You’ll wake up this morning with magnificent views of the Arenal Volcano from your suite before enjoying a hearty breakfast. Then, you will be transferred to the Sky Adventures for today’s tour. 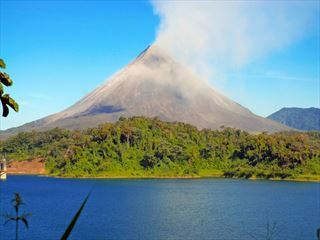 The tour will commence on the Sky Tram, which flies above extraordinary emerald scenery to the top of the Arenal Reserve – an adrenaline-fuelled area comprising of a zip line system which allows you to witness the rainforest landscapes from an entirely breath-taking and unique perspective, soaring in the air. Afterwards, you’ll commence the Sky Trek – which features eight cross-sectional cables which stretch over 1.7 miles, reaching to heights of 660ft so you can witness extraordinary panoramas of the Arenal Volcano and lake. 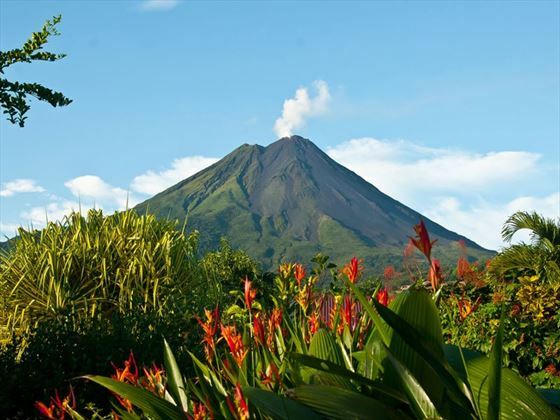 Today you’ll embark on a wonderful hike to the Arenal Volcano to learn about the activity and history of this magnificent sight. Enjoy a gentle trek along the base of this ginormous volcano to enjoy the most extraordinary view and fantastic photo opportunities! In the early morning, you’ll be transferred from La Fortuna towards the Central Valley to take a scheduled flight to Drake Bay, located in the South of Costa Rica. 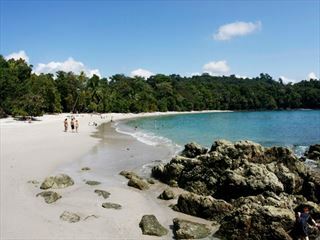 The Osa Peninsula is sparsely populated, and much of this densely populated area is conserved with national parks and private reserves; this is one of the most beautiful regions in the world… enchanting rainforests nestle around serene beaches and beautiful coves. Transfer to the hotel, where you’ll spend three nights. Perched on a towering peak, this lodge offers incredible panoramas of Drake Bay, and each room offers utter comfort and luxury in a jungle ambience. Guests can experience a fantastic selection of activities here, from diving and snorkelling to birdwatching, hiking and mangrove tours. This hotel also features a wonderful location for easy access to the Corovado National Park and Cano Island Marine Biological Reserve. The Jungle Experience Package in which you are staying with, includes a full-day guided tour on day 7 to Corcovado National Park, as well as another full-day guided tour on day 8 to the Cano Island Biological Reserve, which also includes snorkelling. Enjoy breakfast before transferring to the local airstrip to take a scheduled flight back to San Jose. 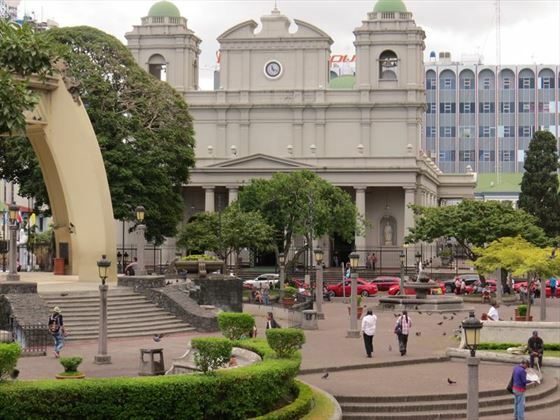 A guide will await your arrival at San Jose, where you will be transferred to your hotel. Take the rest of the day to pamper yourself in the hotel spa, relax by the gorgeous infinity-edge pool or in the Jacuzzi, delight in wonderful cuisine at the restaurant and explore the scenic trails and natural waterfalls found around the resort. After breakfast at the hotel, take a scheduled private transfer to Juan Santamaria International Airport for your return flight.